What am I loving right now? HATS. 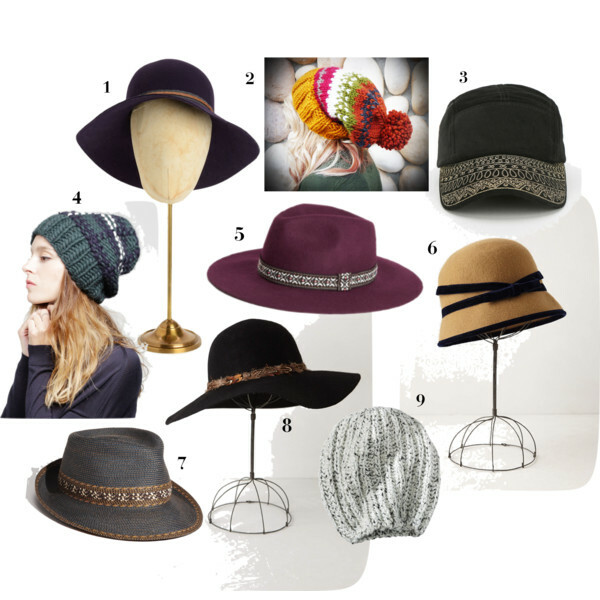 Just because the air is cool and summer sun hats are out of season, doesn’t mean you can’t rock a fabulous hat through the fall and winter months! 1. Let me introduce to you the hat that inspired this post. A lovely eggplant color, wide-brim, wool, floppy hat from rag & bone. 2. Could this Etsy find be any more adorably perfect for fun fall weekend activities? 3. Completely dig the look of this embroidered 5-panel hat from Urban Outfitters. 4. Love, love, love everything about this chunky knit beanie from Wool and the Gang. 5. This wide-brim rancher style hat from H&M just had such a cool vibe I had to add it to the list. Plus the color is so pretty! 6. I admit, this velvet twist cloche from Anthropologie is not my style at all but if you can pull off this look… DO IT. Please. 7. How cool is this Eric Javits fedora from Nordstrom? It comes in black and peanut colors, too! 8. Anthropologie, you’ve done it again. This beyond perfect floppy hat would complete any fall outfit. 9. Wouldn’t you want to keep your ears warm in this classic everyday beanie from Target? Don’t think you can pull off the hat look? I assure you, you can. It might be daunting but you just have to find the right style for you. Trial and error. Take a friend that will give you an honest opinion. (chances are it probably looks better than you think) Hats are fun and you can find one to accompany virtually any outfit. Branch out and find what hats work for you this season!